Before “My Effortless Brilliance” and “Hump Day”, there was a Lynn Shelton film languishing in distribution limbo for over five years. 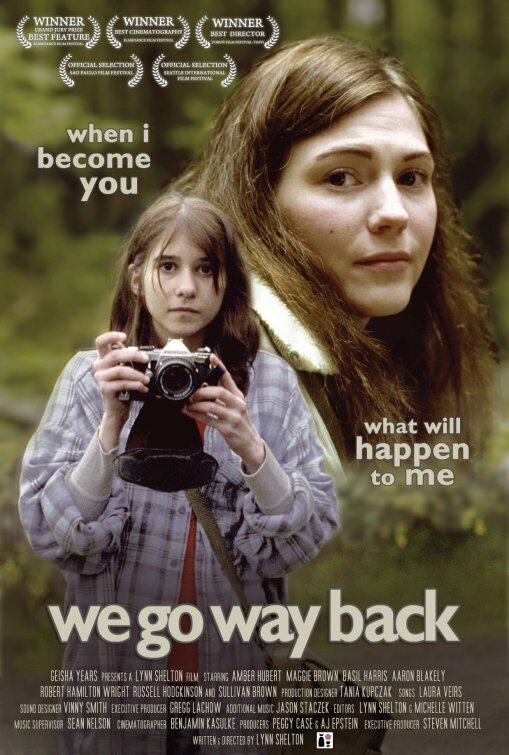 Well, this past Friday night that movie, “We Go Way Back” was finally projected at the reRun Gastropub Theater in the Brooklyn neighborhood of DUMBO. Ms. Shelton was present to introduce this, her first feature. Also in attendance was Amber Hubert, who plays the lead role of Kate, and one of the film’s producers, A.J. Epstein. The story concerns Kate, an actress living in Seattle, a smart and fetching young woman in her twenties but one who has been playing a passive role in her own life. It’s around the time of her 23rd birthday that she is handed the lead in a local production of Hedda Gabler. The play within the movie is presented in a parody, the director being something of a buffoon. For one thing he wants Kate to discretely learn her entire part in the original Norwegian. He also seems to have something of a fixation with potatoes. While this is going on, Kate has a series of sexual encounters where she allows several men to have their way with her. The film takes an unconventional turn at this point when Kate bifurcates into current self at age 23 and also as a young girl of 13. Haunting voice overs of teenaged Kate reading the letters which she would leave for herself to read at each birthday, show a gifted and intelligent young girl. Somewhere along the way, Kate has lost her confidence in her own voice. The film wanders into more esoteric territory at this point, never to quite return. “We Go Way Back” has a dream like charm to it. It doesn’t always succeed in its every attempt but it is still a funny and often moving film. It’s clear from the form of the film, that the filmmaker, who had a background in experimental documentary making as well as years as a film editor, still wants to play with nonlinear storytelling. What isn’t missing is emotional honesty and a lovingly photographed film; the cinematographer is Benjamin Kasulke. It’s a true independent film with two highly appealing leading ladies. Also in the strong cast is Maggie Brown as 13 year old Kate and Basil Harris who would re-appear in Ms. Shelton’s next film, “My Effortless Brilliance”. 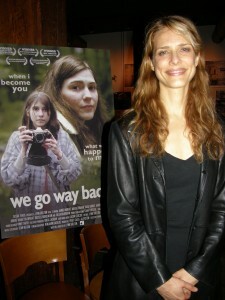 I was at the New York City premiere of the film on Friday night at reBar. After introducing the film, the appreciate audience took in the film, and then were given a bonus opportunity to hear a firsthand account of making the movie and the subsequent long road up to this evening. Before taking a handful of questions from the audience, Ms Shelton first had a conversation with Movieline’s Michelle Orange. The evening topped off at a restaurant directly across the street from reRun, called Superfine, owned and operated by Ms. Shelton’s sister. Coincidence or conspiracy, you decide. The gratis beer was quite good. filmwax endorses both “We Go Way Back” and Coney Island Beer. 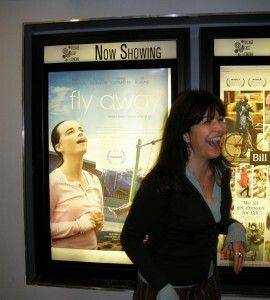 Janet Grillo, the writer/director/producer of “Fly Away” insists that her new film is not about a case of autism but, rather, about a young person who has autism. In other words the film is not about a diagnosis but about a person with a diagnosis. This might seem like a case of semantics to some but at the screening I attended last night, Ms. Grillo —whose own son is autistic— articulated the distinction with clarity and thoughtfulness. The film, while flawed, to its credit is not didactic and completely lacks that “movie of the week” laziness to which so many other films dealing with disease or disorders fall prey. 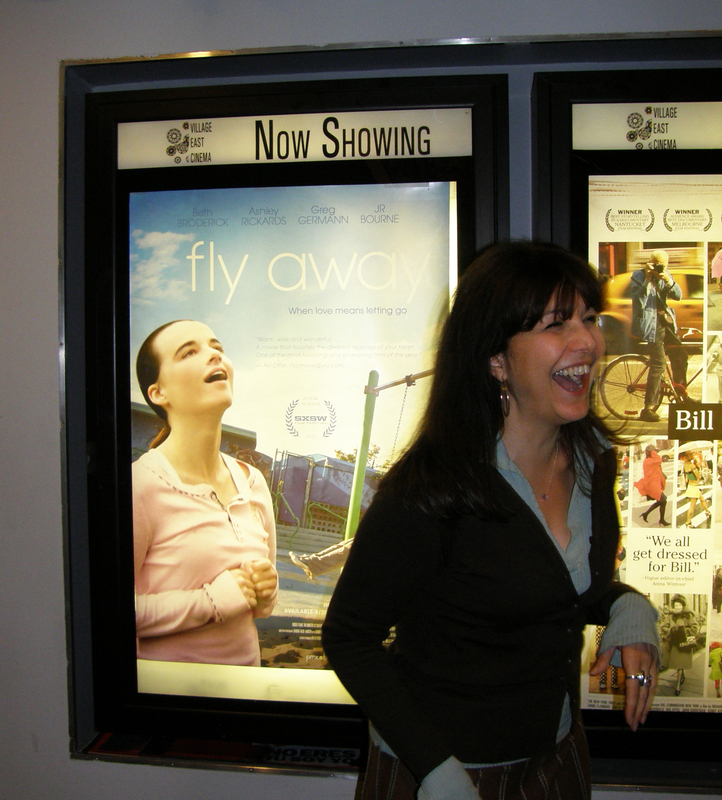 “Fly Away” is generally well acted and quite watchable, probably a result of its strong direction and its two competent leading actresses. One of those actresses is 16 year old Ashley Rickards who plays Mandy, a pubescent and autistic teenager, and who might be known for her work on the TV series “One Tree Hill”. Her performance is uncanny and it was clear during the post-screening Q&A that many audience members assumed that Ms. Rickard was autistic as well. The fact that she didn’t “play” symptoms but a fully developed character is one of the reasons her performance is so affecting. Also in the film are Beth Broderick as Mandy’s mom, Jeanne; a very good Greg Germann as a neighbor and budding love interest for Jeanne; and the always welcome Reno as Mandy’s school principal. Scattered among the audience were a number of people who lives are touched by autism, something that will probably be common at other screenings of Ms. Grillo’s moving film. The sad irony is that the recent spike in diagnosed cases over the past decade or so might mean even larger audiences for the film. 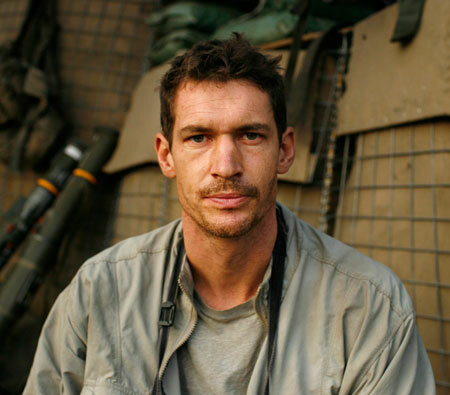 I just got wind of the news that the war photographer, Tim Hetherington, was killed in Libya along side fellow photographer Chris Hondros. Tim was a staff member of Vanity Fair as well as co-director, along with Sebastian Junger, of last year’s “Restrepo”, a documentary about a platoon of American soldiers stationed in Afghanistan. In addition to winning the Grand Jury Prize at the Sundance Film Festival the film was nominated for an Oscar for best documentary. 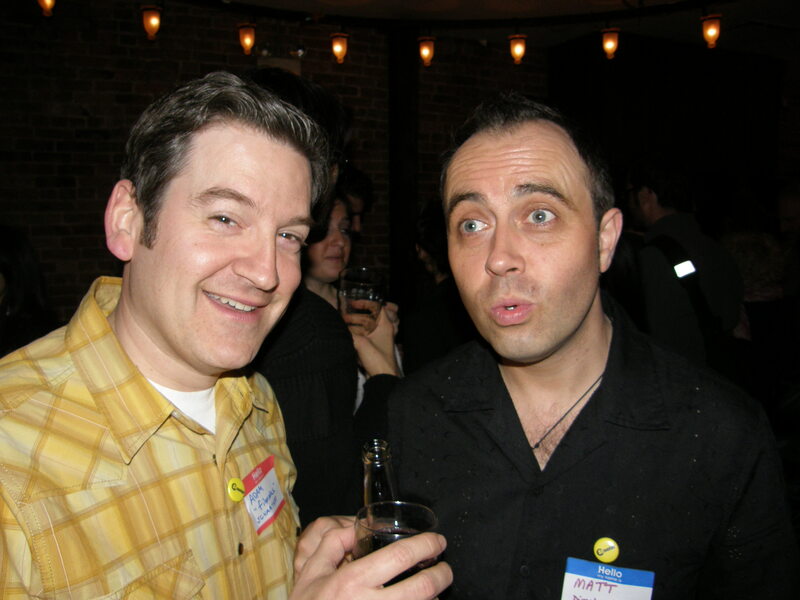 I interviewed Tim for WestView, a West Village local newspaper I used to write for. Tim was warm, gracious and came across as nothing short of an entirely thoughtful man. I am profoundly shaken by this tragic turn of events. What follows is the interview I conducted with Tim over lunch at a local West Village restaurant last summer. Adam Schartoff: I know you and Sebastian both come from a war reporting background. How did you two meet and how did you come to the idea of making this documentary? filmwax: I saw “Limbo”. It was very good. Quite different from the work you’re better known for here in the States, referring to the Stieg Larsson series. Is “Limbo” more representative, would you say, of the work you do? Lena Endre: I work mainly in theater, for the Automatik Theater. I’ve done an awful lot of movies, perhaps the best known is “Faithless” which was written by Ingmar Bergman and which Liv Ullman directed. filmwax: That really put you on the map. Endre: Yes. And it was funny shooting “Limbo” in Port of Spain, because the director, Maria Sødahl, she used to live there as a child. It was about her childhood as she remembered it in the 60’s: the expat families, no roots, kind of terrible existence. filmwax: You mean the constant moving? Endre: Yes, like the life of a diplomat, where one has to move all the time. filmwax: Sort of like an actor, would you say, especially a European actor? Exposure for a European actor means working around the globe, does it not? 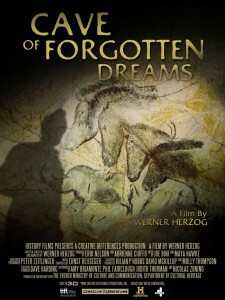 In his latest film, “The Cave of Forgotten Dreams”, Werner Herzog has made his most stunning documentary yet, in 3D no less. And this man has made some amazing documentaries. If anyone hasn’t seen these other favorites: “Grizzly Man” (2005), “My Best Fiend” (1999) or “Little Dieter Needs to Fly” (1998), don’t rent them… buy them! Herzog has been accused for being something of a showboat filmmaker; that he’s more interested in showing off, more interested in creating spectacle, than he is in telling human stories. I don’t know about that. I can see some strain of legitimate criticism in there, I suppose. Even if it is the case that some of his narrative films have leaned toward the grandiose, many of his documentaries have shined with humanity. “Dieter” is one of the most touching and evocative examples, and one of the best docs I’ve ever seen. It tells the story of German-born Dieter Dengler, a fighter pilot for the U.S. Air Force who was shot down over Laos during the Viet Nam war. He was captured and tortured for years before his eventual rescue. Dengler’s story is better known from the fiction film version of his story, “Rescue Dawn” (2006) starring Christian Bale in the role of Dengler. 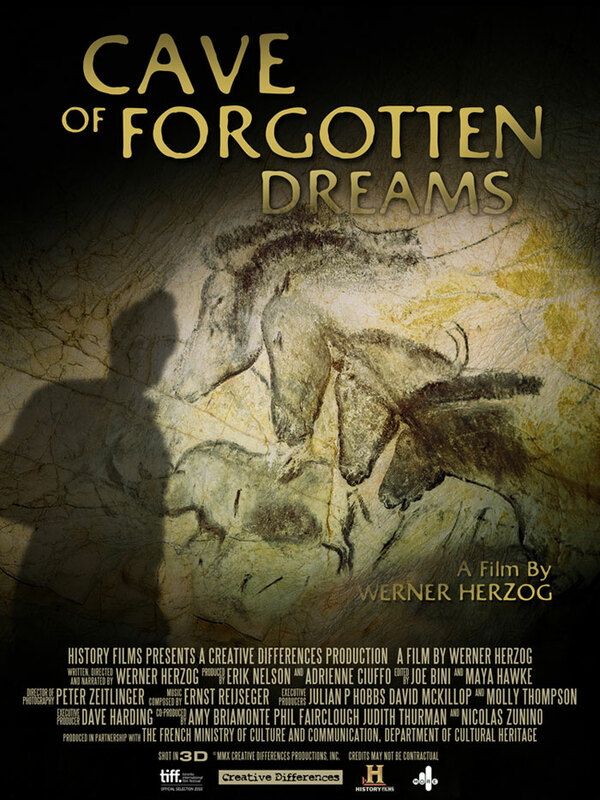 That movie was directed by none other than Herzog himself who felt compelled to tell Dengler’s story a second time. For me, regardless of how well the more recent film was made, it’s the documentary that won my heart. Likewise, after making some five classic films with actor Klaus Kinski, Herzog directed “My Best Fiend” (a nice play on words) about his deceased leading man and former roommate. While best known for “Fitzcarraldo” and the remarkable “making of” documentary, “Burden of Dreams” directed by the great Les Blank, Kinski does some incredible work in films like “Aguirre: The Wrath of God” and “Nosferatu The Vampyre” to name just two. Once upon a time we could easily separate ourselves from soldiers of war. What they were doing, the acts they committed in the name of peace or peacekeeping, happened, you know, over there. We were here in the civilized part of the world, safe and sound, reading stories in the paper or watching the news on TV. Two things changed all that: 9/11 and the cottage film industry it spawned. Documentaries like Janus Metz’s “Armadillo” and last year’s “Restrepo” have put the camera right into the center of the action, and by extension, us as well. We have become complicit, to some degree, by becoming witnesses while soldiers perform their functions. If a heinous act is committed, we are there to see it. 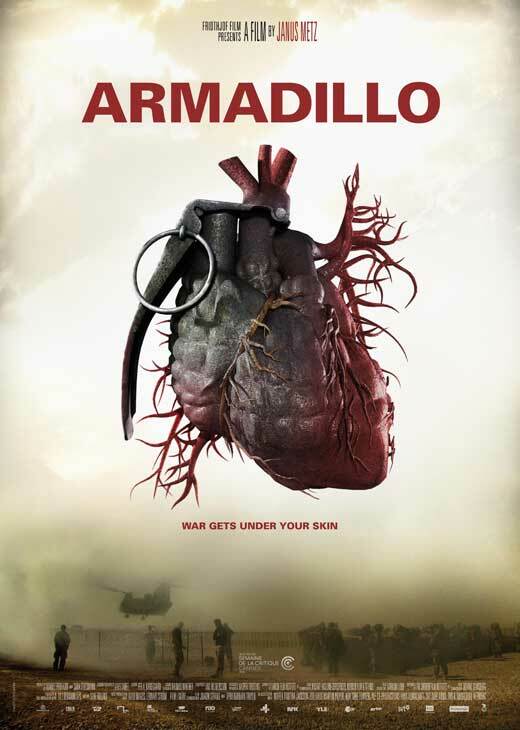 With “Armadillo”, the military has given Metz, a Danish filmmaker making his feature-length debut, unprecedented access within the embedding process (though with parameters). Like last year’s “Restrepo”, Janus Metz’s “Armadillo” puts us, the audience, right into the center of the action. The director & his cameraman were side by side with the Danish soldiers of the Armadillo army base over the course of their six month tour of duty. The film’s denouement comes when the platoon, under ambush by local Taliban, potentially transgress war conventions. As a result, the military tries to reneg on the embedding contract they have with Metz, pressuring him to edit the film of that section. Of course, forcing the issue will only end in bad publicity for the military so they relent and Metz releases “Armadillo” as is. In a panel discussion after the screening I attended, Metz describes the difficulty of alienating the soldiers after having bonded with them during the process of making the film. He was, after all, right in the trenches with them as well before and after, even getting to know their families. A number of the soldiers felt he betrayed since the footage could have destroyed their careers and reputations, and indeed certainly make them look like they used poor judgment. But, more importantly, what comes from viewing the film from a thoughtful standpoint, is that one should be very careful in judging how people respond under such remarkable circumstances. 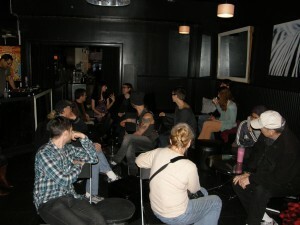 We had a wonderful turn-out for the first filmwax night of short films. The back room at The Fifth Estate was pretty packed by the time we got started with the animated short, The Mouse That Soared directed by Kyle Bell. Following that came Mike Cerda’s Craving, Elliot Fu’s Tiptoe, Danielle Katvan’s Laundry, Kasia Kowalczyk’s The Bread Squeezer & Kaz Phillips’ megafauna. Not all the filmmakers were physically present at The Fifth Estate last night. Mr. Bell lives in Portland, Oregon but had given his blessing to show the funny animated short about a mouse who is brought up by birds. Ms. Katvan who lives on the West Coast was also not able to be present but that was solved by a microphone and my iPhone. After showing her three minute plus short about a blossoming romance that takes place in the imagination of a guy at a laundromat, I called Danielle up for a live audio chat. It was a lot of fun and the audience seemed to appreciate the spontaneity of it. Also, Ms. Katvan’s parents, Manhattanites, were in the audience to represent. The evening began to build a bit around the time of the final two shorts which were more narratively somewhat more dense. Kasia’s short, The Bread Squeezer, the evening’s longest bit, is a comedy about the life of an orphaned man who learns how to replace his need to squeeze loaves of Yummy Tummy bread with a real living “squeeze” instead. It’s a very sweet film and stars Kasia’s husband, Tal Harris. Both Tal and Kasis are long time friends of filmwax. The same may be said of Mike Cerda who has been at every event thus far (last night was the 4th) who has been also default event photographer as well. The final short was something of a last minute scheduling addition, megafauna, a more tonally serious film. Directed by Kaz Phillips, megafauna concerns a couple who are going through a difficult phase in their relationship and have decided to video tape their thoughts on love and relationships. The idea doesn’t work out so well; the male character not begin quite very open to the process and expressing his cynicism. A walk-out leads to a tragic turn of events. In another film this unfortunate turn might have seemed contrived but due to Ms. Phillips earnest, mature approach, the film –14 minutes in length– is poetically and emotionally effective. After the film, the filmmakers, which also includes Kaz’s husband, Dan Safer; Kasia’s husband, Tal, Tiptoe’s editor, Gary Marino, among others, hung out at the bar and continued the conversation for another hour or more. The next night of shorts which is as yet unscheduled, will likely consist of winners from Shooting People‘s film of the month contest. My favorite American director died this morning at 86, having lost a battle with lymphoma. 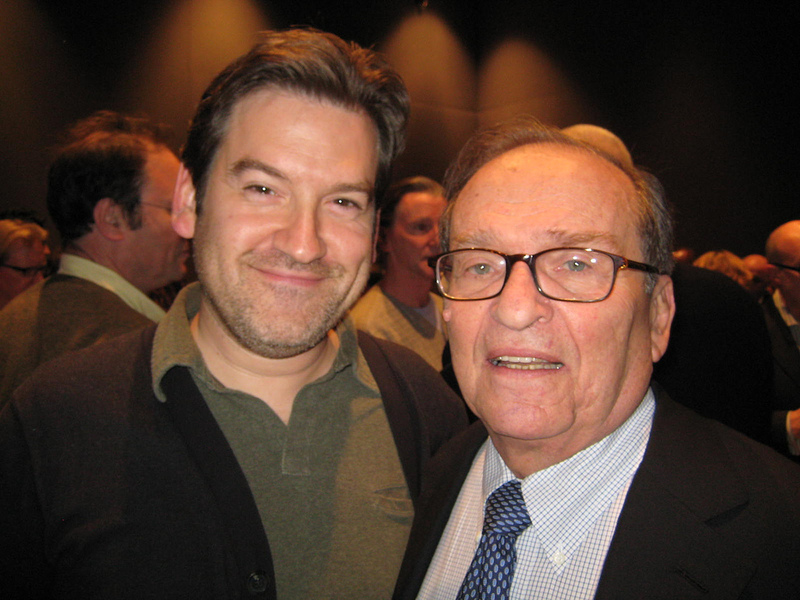 Lumet, whom I had the pleasure of meeting a few years ago, has directed some of the greatest movies made over the past few decades. His track record is remarkable. It includes “Serpico”, “Dog Day Afternoon”, “Network” and “The Verdict” to name just a few. 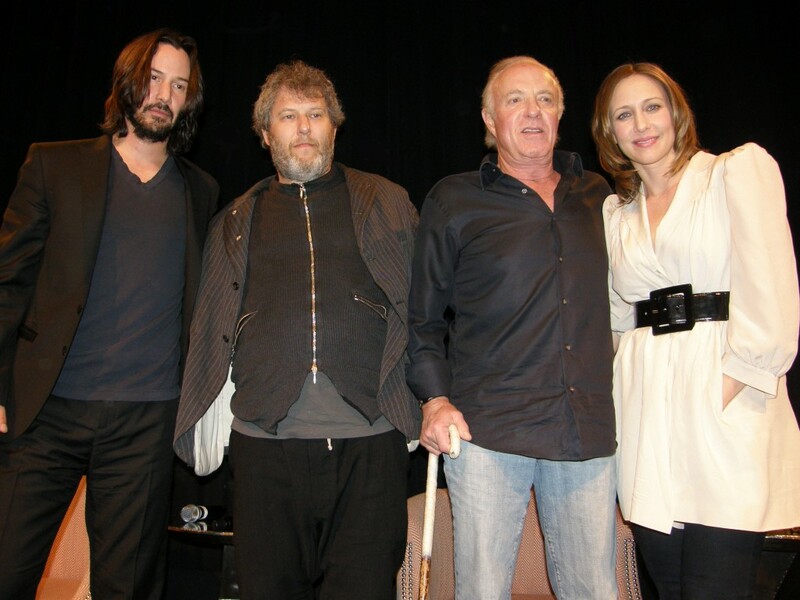 My path crossed with his at the 2007 New York Film Festival where he premiered “Before The Devil Knows You’re Dead”, his last movie. This video is a short clip I shot where he describes his preference for working digitally. Of all his films, my personal favorite is “The Verdict” (1982). It’s also my favorite Paul Newman performance. He really delivered the goods in his Oscar-nominated portrayal of Frank Galvin, a down-at-his-heels attorney. It’s an incredibly calibrated performance, low-key with absolutely none of the hysterics that Pacino brought to so many of Lumet’s other earlier films. Newman was not in the habit of playing losers but was beginning to really stretch at this point in career. With Jerry Weintraub, George Clooney, George Bush, Barbara Bush, James Caan, Matt Damon, et al. 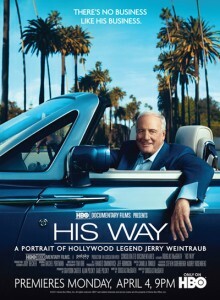 Jerry Weintraub is on a blitz. First there’s the HBO special, an HBO Documentary Films production called “His Way”. In addition to the infamous producer/promoter Weintraub himself, also appearing is a stellar constellation of stars including Matt Damon, George Clooney, Brad Pitt, Julia Roberts, Bruce Willis, former White House denizens George &amp; Barbara Bush among others… all gushing about their friend. Directed by Douglas McGrath, “His Way” also includes interviews with the two loves of his life, wife and former singing sensation Jane Morgan, as well as his girlfriend, Susie Ekens. The two women, both of whom have accepted the unorthodox love triangle, also spend significant screen time gushing about their man Jerry. In fact, nobody has anything bad to say about Jerry Weintraub. There is also the book, When I Stop Talking, You’ll Know I’m Dead, a memoir written with Rich Cohen, and for all intents and purposes follows the same exact formula as the HBO documentary. Both entities include a series of funny, easily digestible anecdotes about Jerry’s rise to the top. How to make sense of all the days I’ve been spent running around from one film event to another? At times, it feels quite overwhelming; the sheer volume of articles due, promises yet to be fulfilled. But! there are certain experiences that make it all worthwhile. Walking into MoMA on a rainy afternoon yesterday and taking a seat up front at the Titus 1 theater. 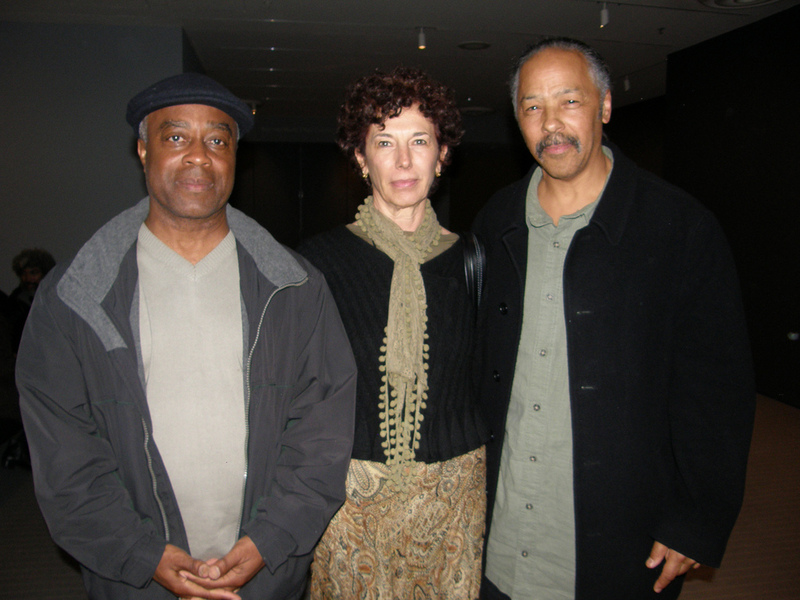 I watched “My Brother’s Wedding” and “To Sleep With Anger”, two films directed by Charles Burnett. MoMA is doing a career retrospective on the seminal filmmaker and with good reason. 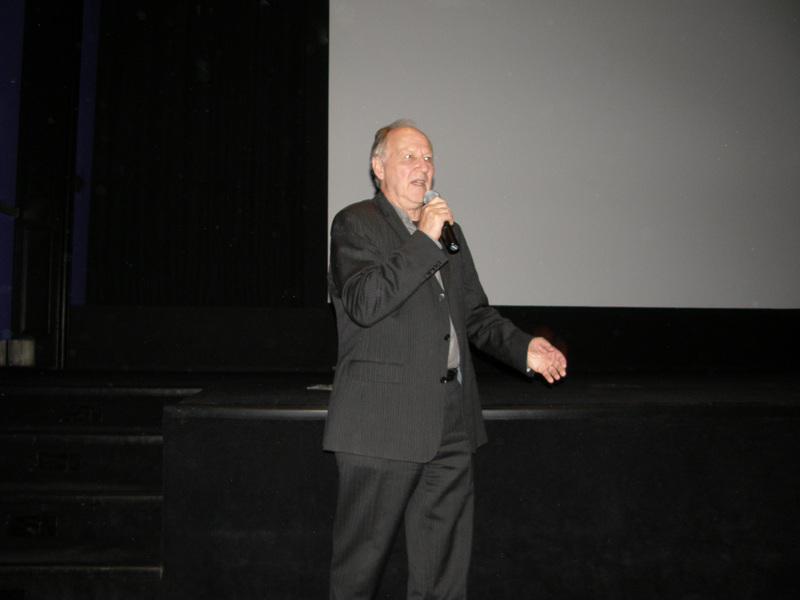 Burnett has been at the museum to introduce several of the films throughout the week-long series, including the two films I saw. James Caan does not take a press junket very seriously. In his company no one else can either as they would only come off as pretentious. 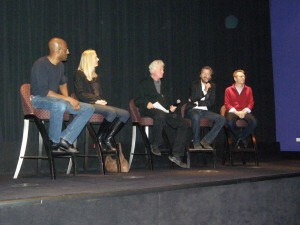 So instead, there was much silly banter at the the press conference for “Henry’s Crime”. The film stars its executive producer, Keanu Reeves, as Henry, a toll booth collector who gets mixed up in a crime and goes to jail where he meets Max, played by Caan. After Henry gets out of the slammer he gravitates towards another crime but gets sidetracked by an acting role of all things. Keanu seems to be moving into the next phase of his career. If “Henry’s Crime” is any indication, it might mean this Hollywood leading man might be looking for character roles. This would be a great thing and give him a career that is closer to an Al Pacino than a Warren Beatty. Good move for Keanu as he approaches middle age. He actually comes off quite warm and accessible. Refreshing. Vera Farmiga is lovely but what else are you expecting. Smart career trajectory. In January 2009, nearly 15 years after the death of comedian Bill Hicks, David Letterman invited his mom, Mary Hicks, on his show Late Night. A year before his 1994 death, Hicks made an appearance on the talk show and performed his routine to an appreciative audience, like he had in at least a dozen or more prior appearances, so it was very unusual what ensued. Letterman judged the segment substandard and cut it from the show. What few knew, including Letterman, was that Hicks was dying from pancreatic cancer at the time. Looking back at the segment with the late comedian’s aging mother, Letterman, unable to recall what he had found so objectionable, admitted that he couldn’t justify that decision. In fact, he added that the segment showed a comedian at the top of his game and well ahead of his time. And, indeed, perhaps that was the point. 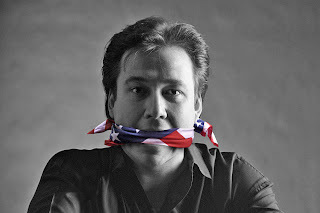 Unlike Letterman, Hicks’s style was brash and confident but also absolutely authentic, free of show biz phoniness. Perhaps this had occurred when the talk show host was feeling especially insecure. I had just turned in my review for the new documentary, “American: The Bill Hicks Story“. When I walked out of the screening last week I didn’t initially feel that blown away but, as happens on occasion, as I began to wax on it, I realized that had left more of an impression than I thought. It sort of marinated a bit and as I wrote the review, I thought about how much I admired the entire approach to the filmmaking and how the interviews focused entirely on Bill’s loved ones, as opposed to famous personalities. The doc was co-directed by Matt Harlock and Paul Thomas, a pair of Brit first-time directors. To repeat myself, I had just turned my review in to film-forward last Sunday, one which turned out pretty positive response in the end, when just by coincidence I ended up running into one of the filmmakers at Monday night’s Shooters in the Pub. 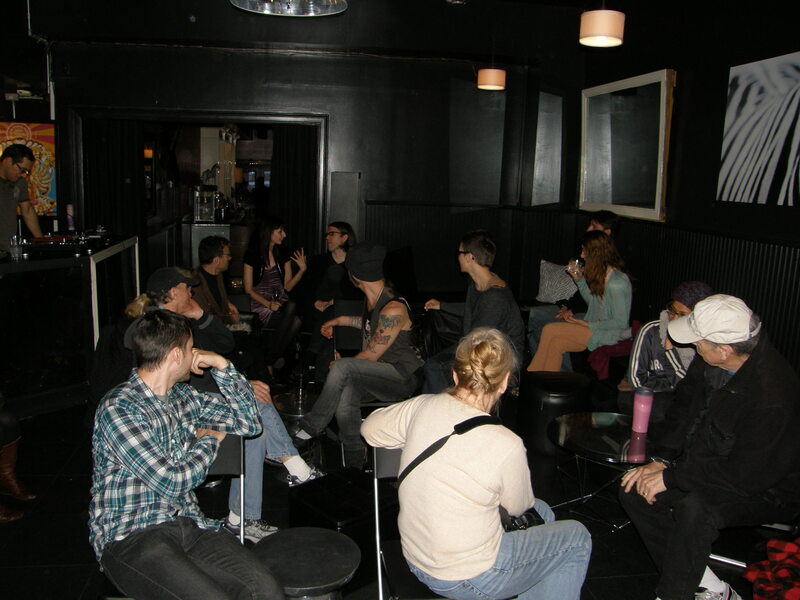 This is a monthly social networking event for filmmakers or other related industry folks hosted by a LES bar called Sweet & Vicious. I attend just about every month for two reasons, no three, actually. First, I am friends with the people who run the sponsoring organization, Shooting People, and write posts for them on occasion. 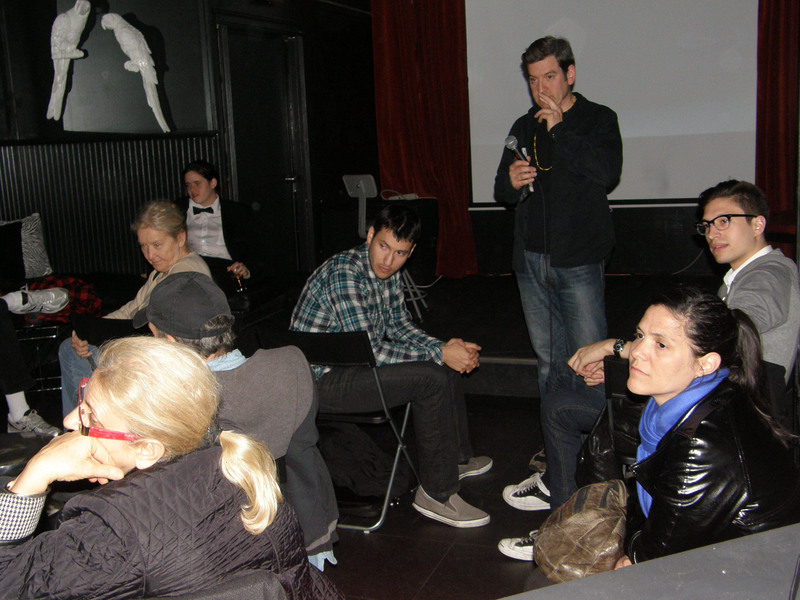 Secondly, I am shopping for films for the filmwax film series and many eager filmmakers come to these networking evenings. Third (& fourth), I can see my friends and drink cheap or for free (always an incentive). Meeting Matt was a nice chance encounter. He was a really funny warm guy, and he gave me a movie t-shirt! 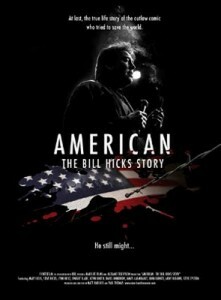 I now advertise American: The Bill Hicks Story. The Ponce family business is in trouble. For over a century they have been clowning, contorting, and taming big cats for audiences throughout the back roads of Mexico. And now not only is the future of their circus, the Gran Circo Mexico, in the balance, but, indeed, the family unit itself. 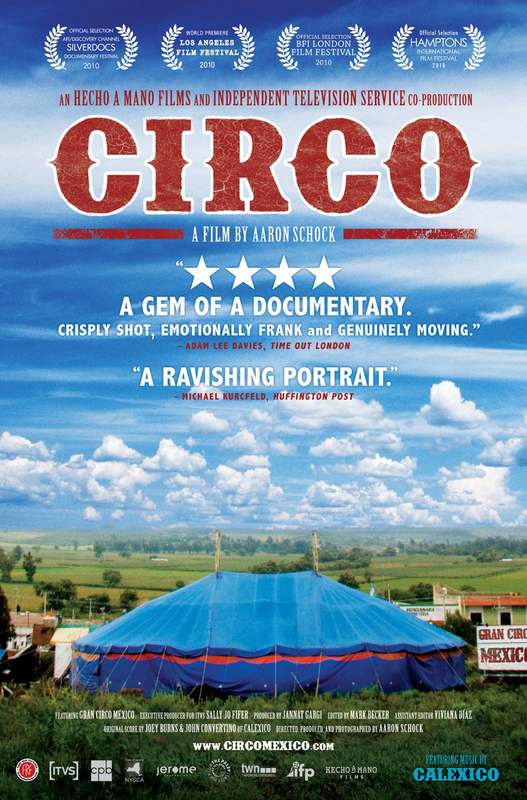 The ringmaster, Tino, and his wife, Ivonne, are bringing up five circus performers, one of whom is a niece. 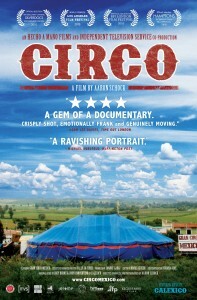 For Tino, traveling ceaselessly with the circus represents a dual responsibility. On the one hand, it continues a tradition passed on from his parents and grandparents; on the other, it’s about the next generation.